Denver’s Union Station is one of the more unique spaces I’ve been lucky enough to visit. Union Station brings to mind terminals and commuters, travelers and families, the hustle and bustle of people coming and going. It doesn’t bring to mind restaurants and lounge spaces, elite bars and swanky hotels. 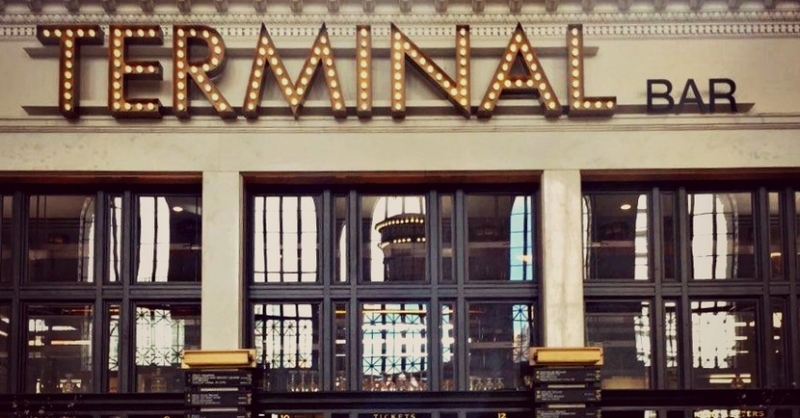 Union Station in Denver has transcended the stereotypical idea of a “train station” and transformed the historical building into a multi-purpose space with restaurants, shops, and co-working stations. It’s a traveler’s dream! A place with free internet where you can get breakfast, lunch, and dinner all while charging your phone? Yes, please! I could go on for hours about the many things that Denver’s Union Station has going for it. To keep my excitement reeled in, I figured I would organize it into topics: food, shopping, and accommodations. While Union Station does act as a transportation hub for trains and buses, it also serves as a space for people to pass time. It also has a lot of personality. From the elegant chandeliers hanging from the ceiling to shuffleboard tables in the center of main area, you’d never know this space was meant to serve as a transportation hub. The Crawford Hotel opened up with Union Station during the grand reopening in 2014 after going through major renovations and upgrades. The boutique hotel is built right into the original Union Station structure and embraces the traditional style and architecture of the building. It’s beautiful inside and out and is accessible to guests through Union Station as well. Lucky for those staying at The Crawford, they have easy access to several fantastic restaurants and bars without having to step outside. Where to start! I managed to try almost every single restaurant in Union Station while visiting. It helped that I stayed at the Hotel Indigo Downtown Denver right across the street during the first half of my Colorado getaway. For a quick bite, ACME Delicatessen offers deli sandwiches inspired by those you’d find in New York City. They have delicious sandwiches that are also customizable with toppings and dressings. Try them for breakfast, lunch or dinner. Pigtrain Coffee Co. is another great stop if you’re on-the-go. Order a hand-crafted coffee or espresso drink and even craft your own! They also have a variety of pastries and snacks if you’re feeling a little peckish. Want something for breakfast? Snooze, An A.M. Eatery is a local favorite. Be prepared for a wait if you’re going during peak breakfast, brunch or lunch hours. When you get your food, you’ll understand why it’s such a popular spot. It's amazing! For a casual meal and over 30 local craft beers on tap. They have shuffleboard tables and communal seating in the center of Union Station extending outwards from their bar. For a little more swank, head to The Cooper Lounge for high-end cocktails, an impressive wine list and fantastic views. With a tricky entrance and more elite crowd, Cooper isn’t for everyone but if you feel like dropping a few bucks on a cocktail, it’s worth it for the experience. Make sure to plan a reservation in advance. This spot books up quick! Do you love seafood? Stoic & Genuine is a farm-to-table restaurant that has all their seafood flown in daily. Indulge in a raw oyster bar or enjoy classics like Maine Lobster, Tuna Tartare, and even Caviar. If you prefer red meat, Next Door American Eatery serves up the best burger I’ve ever eaten. They also have great happy hour specials and a menu that can’t be beat. Next Door’s ingredients are locally sourced also partaking in the farm-to-table scene. Finally, Mercantile is a European-style farm-to-table “market” and ‘restaurant” that serves both bites to go and bites to eat in. The to-go market is a bit more affordable than the restaurant but both have scrumptious choices inspired by the best cuisine throughout Europe including handmade pasta, foie gras, pastries and more. And for dessert? Milkbox Ice Creamery serves some of the best ice cream I’ve ever had including non-dairy options for poor souls like myself. If there is one spot you visit for a bite in Union Station, Milkbox has to be it. Since I’ve visited, one more restaurant has opened up. Ultreia is a Spanish and Portuguese tapas restaurant which is right up my alley. I wish it was open back when I visited so I could have tried it out! While Union Station’s best feature is certainly all the food options, the building also has a few shops to browse through as well. Tattered Cover Book Store has a satellite location in Union Station. It’s small compared to the other locations but that doesn’t mean they don’t have it stocked to the ceiling with books! It’s the perfect taste of the small local chain that speaks to book lovers everywhere. For odds and ends, souvenirs, clothing and other random items, 5 Green Boxes and Bloom carry a variety of items from home decor to t-shirts.